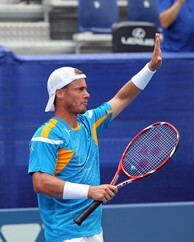 Lleyton Hewitt waves to the crowd after his quarterfinal win. 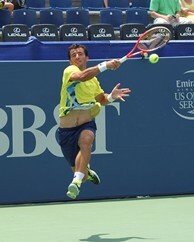 Ivan Dodig showed energy on this stroke. After a very lethargic start which saw him drop the first set 1-6, former No. 1 Leyton Hewitt stormed back to trounce Croatia’s Ivan Dodig 1-6, 6-3, 6-0. Hewitt continues to show a new streak of high performance, following his final appearance in Newport and an uptick in his ranking this year of nearly 50 spots. Dodig came out blazing in the first set, easily holding serve and firing eight aces. Twice he broke Hewitt, who buried numerous balls into the bottom of the net and seemed to struggle finding his strokes. Hewitt had trouble returning Dodig in the initial set, winning only four of twenty return points. But those numbers would change dramatically as the match went on. Hewitt was first to serve in the second and said his strategy beginning the set was to "try and hold and stay ahead because Dodig is a very good frontrunner." The players were on serve at 2-2 in the second when Hewitt began coming to life. He started returning the ball better, especially second serves, winning seven of 13 second-serve points. At the same time, Dodig’s first serve percentage fell to 48 percent, down from 60 percent in the first set. Ahead 4-3 in the second, Hewitt was able to break Dodig, in what he called "a important game" and then held serve in the following game to close out the set and level the match. At that point, the on-court momentum had clearly shifted and Hewitt started the third set looking calm and relaxed while Dodig appeared anxious, sensing that the match was starting to slip away. Dodig’s serving struggles continued and Hewitt capitalized winning four of seven points on first serve during the set and an impressive eight of nine points on second serve. Looking for answers, Dodig attempted several ill-fated drop shots, but the still speedy Hewitt was able to track them down and make Dodig pay. With the crowd solidly behind the Aussie, Hewitt broke a defeated-looking Dodig three times in the final set and cruised to a 6-0 finish. Hewitt now awaits the winner of the John Isner versus James Blake, now 33. Hewitt said, "He’s is a fantastic mover, especially on hard court." The Australian wouldn’t predict who would win that match-up "A lot depends on how well John recovers," he said. Isner had a tough three-set victory Thursday night over 19-year old Christian Harrison, Ryan Harrison’s younger brother.